I know I've said it before, but beef cheeks are freaking amazing! When braised at low temperatures for hours on end, you end up with meat so tender, you don't even need to chew it...really. Although I have a freezer PACKED with delicious lamb, beef, pork and chicken from my recent meat share pick up, I couldn't resist picking up some beautiful beef cheeks today. They were calling my name from behind the butcher's counter. I usually make a basic stew using cheeks, but after getting home and into my comfy clothes, I realized I didn't have all the ingredients I needed for a delicious stew, like my staple carrots and sweet potatoes. I could have gone back out to get some veggies, but that just didn't happen. Today was my day off and my pajamas won. This isn't so much a recipe, but a loose description of me being lazy and scrounging in my kitchen for things to put together. I had an onion, a bunch of garlic and some fresh rosemary so decided to try something really basic. 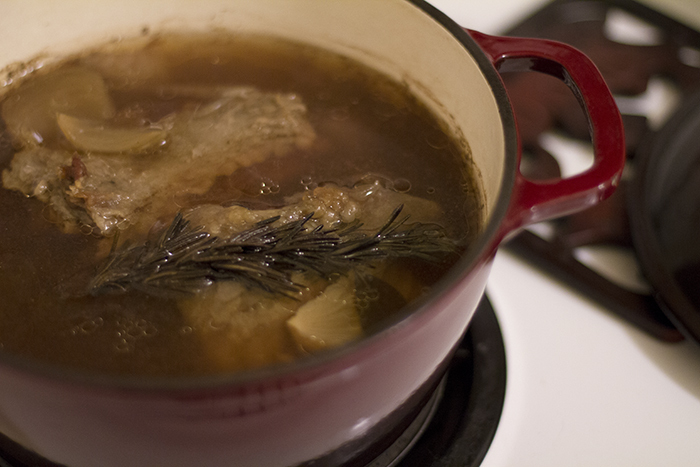 I placed the beef cheeks in a dutch oven with 3 cups of filtered water, half an onion, 6 cloves of garlic, and a sprig of rosemary. I even threw in a bay leaf just for fun. I put it in the oven at 250 F for 4 hours and proceeded to lay on the couch catching up on some reading and watching back to back episodes of Louie. At the fourth hour I found myself half dozing on the couch (my body does not cope well with daylight savings time in the spring). I peeled myself off the couch, turned off the oven and left it in there for another hour while I napped some more. I figured it would just be even more tender given the extra hour. Around 8 pm I decided to haul my 'cheeks' off the couch and take my lazy girl's brew out of the oven. It smelled really good! 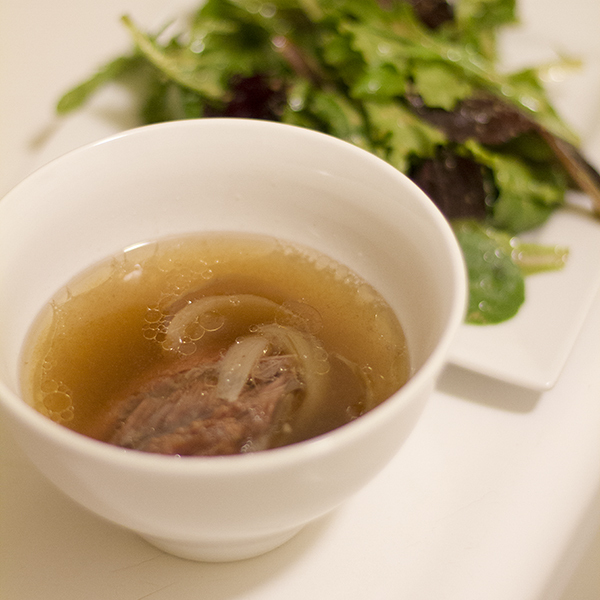 The beef cheeks were beyond fork tender; they were SPOON TENDER! I served some up in a bowl and added sea salt to taste. I made a lovely little salad with some homemade dijon balsamic and garlic dressing and took some glamour shots. It was really really good and so incredibly tender. Now, because beef cheeks have a lot of collagen and connective tissue, I'm expecting this (soup? stew?) to turn into beef cheek jello by the morning. Beef cheeks also contain quite a bit of fat so it makes this a very satisfying dish and would be perfect for someone following a GAPS type diet. Very nourishing with lots of gut healing goodness! Looking forward to some meat jello in the morning!